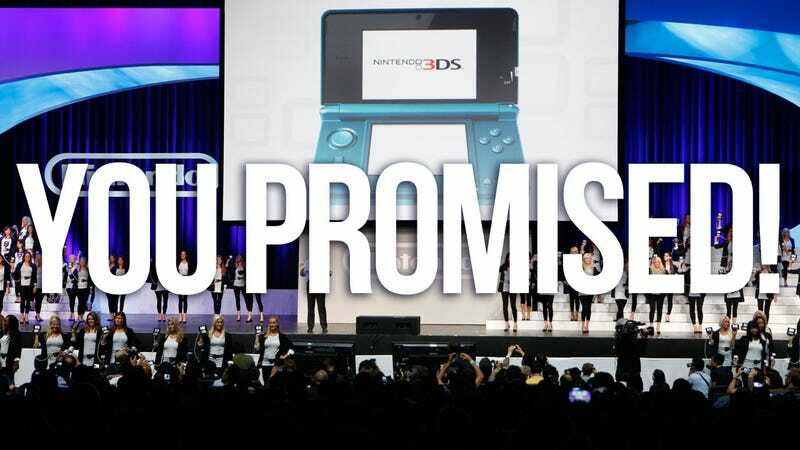 One Year Later, Did Nintendo Keep Their E3 2010 Promises? Riding high from strong Wii and DS sales, they had reason to be confident and ambitious. The pressure was on. Both Sony and Microsoft—whose E3 2010 promises we've also been checking—were promoting motion controls, an area of gaming Nintendo pioneered. Right out of the gate, Nintendo hit us with a preview of the next Zelda game, The Legend of Zelda: Skyward Sword. Despite some technical difficulties during the demo, Nintendo's top game maker, Shigeru Miyamoto, promised that the game would be ready "next year", meaning 2011. Verdict: NBA Jam was eventually released on both PS3 and Xbox 360, so the game wasn't an exclusive. Technically Nintendo didn't say that the game was a Wii exclusive, just that there would be an exclusive "version." That said, almost every multi-platform game that's released on the Wii is technically an "exclusive version." Verdict: Technically they were wrong, but that's not really a bad thing. The game was in stores on October 3. Since October is in the last quarter of the year it could be construed as "holiday", but I think of October as fall, because drug stores were selling Halloween candy, not candy canes. Verdict: Golden Sun: Dark Dawn made it to stores on November 29th, smack dab in the middle of their window. Verdict: Epic Yarn shipped on time, arriving on October 17th, 2010. Verdict: Studios try not to put out specific release dates until they're sure they can make them. Nintendo saw it through and DQIX came out on 7.11.10, as promised. Nintendo announced their new Metroid at their 2009 conference, but, this year, Nintendo was ready to say that Metroid: Other M would be in stores on August 31st, 2010. Verdict: Donkey Kong Country Returns was released on November 21st. Nintendo waited til the end of the show to bring out the big guns, rolling out the 3DS and giving us a little taste of what it could do. Some of the console's new basic hardware functions were detailed. Nintendo claimed that the 3DS would have a 3.5" 3D top screen, with a DS-like lower touchscreen that would not display 3D images. It would have a 3D slider that players could adjust to modulate the "level" of 3D or turn it off, as they pleased. They also added an analog "slide pad", a motion sensor, a gyro sensor and a 3D camera. Lastly, Nintendo sheepishly mentioned that the 3DS would be able to play movies and movie trailers in 3D, but emphasized that they weren't sure how much content would be available or when it would be ready. Verdict: Pretty much everything they said was correct. The 3D screen is 3.5", and all of the other technical features (touchscreen, 3D camera, motion sensor, gyro sensor, etc) are in the retail version of the console. After flashing that list, they went through some of the developers, revealing that many of these studios were making 3DS versions of their biggest franchises. Activision and Harmonix Vicarious Visions were creating DJ Hero 3D. Level-5 announced Professor Layton and the Mask of Miracle. Square-Enix was making an unspecified Kingdom Hearts game. THQ was working on a new Saint's Row. EA planned on releasing non-annualized versions of FIFA and Madden. Capcom announced that were working on a new Resident Evil. Ubisoft announced Assassin's Creed: Lost Legacy. Finally, Warner Brothers Games didn't announce a game, per se, but a slide was shown with their logo and a Batman symbol. DJ Hero 3D: DJ Hero 3D hasn't been officially cancelled, but common sense say it will never see the light of day. Activision has said that they aren't publishing any music games this year and Harmonix Vicarious Visions, given their delicate position at the moment, will probably let this one fall by the wayside. FIFA, which is now FIFA 2012, is expected to come out some time this fall, but no specific date has been given. Resident Evil: Mercenaries, a fleshing out of the time-attack mode in many of the series' past entries, will be in stores on June 28th. Assassin's Creed: Lost Legacy: Similar to the Kingdom Hearts game, I've never heard of this game outside of this event. No rumors. No news. Nothing. Final Verdict: Coming out of E3 last year, the consensus was that Nintendo did the best job of the three console makers. Looking back, it seems that, while they gave the best performance, they were actually the least able to back up their claims. Yes, they managed to get out all of the Wii and DS game that they showed. The model of the 3DS that they showed at E3 is basically what they ended up shipping earlier this year. But when it came to their largest and most important claims—those concerning software support for the 3DS—their track record was pretty bad. Their failure to get some of these games off the ground has translated to lackluster 3DS sales.